Oropharma Avi-Chol is a dietary supplement for birds for an optimal liver function and a good moult. It is a unique liver tonic based on sulphuric amino acids, biotin, sorbitol and vitamin B12. Avi-Chol ensures optimal growth, perfect plumage development and pigmentation in young birds as well as perfect plumage development and pigmentation in moulting birds. This product also promotes the elimination of waste products from colour pigments and medicines. 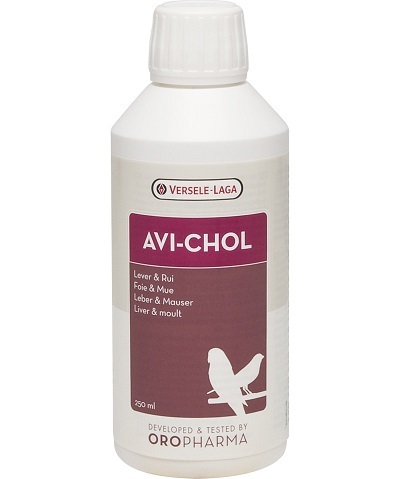 Avi-Chol contains the active components (methionine, choline, biotin, vitamin B12 and sorbitol) required for optimal liver function resulting in a perfect, glossy plumage and pigmentation..
For administering via eggfood: mix the dose of Avi-Chol first in the water which will be used to moisten the eggfood until you obtain a homogenous mixture..